Because the Census Bureau data released today for 2016 only included counties with populations of 65,000 or more, Falls Church City, Va.,--an independent city which the Census Bureau treats as a county—was not included. 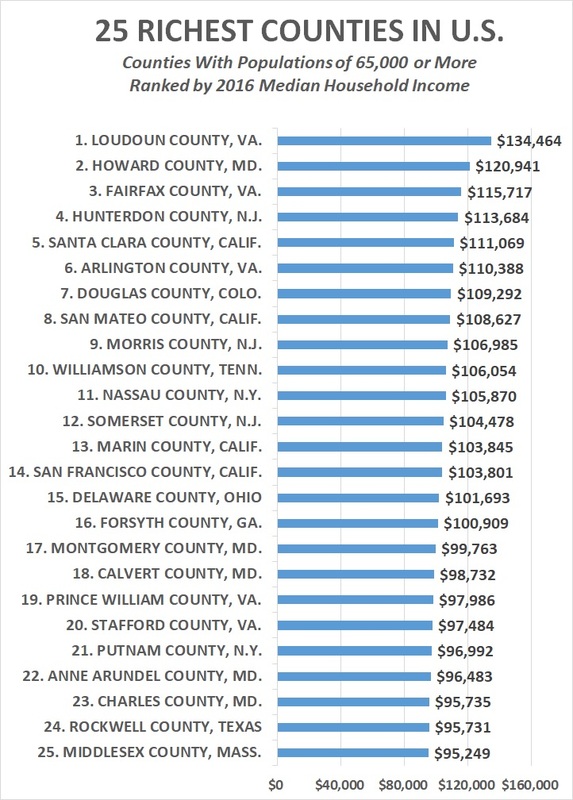 In data that the Census Bureau released in December 2016--giving the 2015 median household incomes for all counties regardless of their population--Falls Church City had finished as the nation’s second wealthiest county (behind Loudoun) with a median household income $122,092. With Falls Church City included in the 2015 data, the nation’s four wealthiest counties were D.C. suburbs. Yet even with Falls Church City excluded from the 2016 data released today because of its small population, 4 of the ten wealthiest counties in the nation in 2016 (with populations over 65,000) were suburbs of Washington, D.C.
Hunterdon County, N.J., with a 2016 median household income of $113,684, ranked No. 4—making it the wealthiest county in America with a population over 65,000 that is not a D.C. suburb. Hunterdon is located in Northern New Jersey to the west of New York City. Santa Clara, Calif., ranked No. 5 with a median household income of $111,069. Santa Clara is the heart of Silicon Valley. But it barely surpassed Arlington County, Va, which ranked No. 6 with a 2016 median household income of $110,388. Arlington is directly across the Potomac River from Washington, D.C.
Douglas County, Colo., which is south of Denver, ranked No. 7 with a 2016 median household income of $109,292. San Mateo, Calif., which sits on the San Francisco Peninsula between Santa Clara and San Francisco counties, ranked No. 8 with a 2016 median household income of $108,627. Morris County, N.J., which borders Hunterdon County in Northern New Jersey, ranked No. 9 with a 2016 median household income of $106,985. And Williamson County, Tenn., which is just south of Nashville, ranked No. 10 with a 2016 median household income of $106,054. Additional D.C.-area counties that were among the 25 richest in the nation included: No. 17 Montgomery County, Md. ; No. 18 Calvert County, Md. ; No. 19 Prince William County, Va.; No. 20 Stafford County, Va.,; No. 22 Anne Arundel County, Md. ; and No. 23 Charles County, Md.